Users like to partition or create separate divisions of their hard disk drive for better administration, space management and access control. By dividing a disk into several partitions, users can allocate a separate purpose for each division, e.g. one partition for the operating system and others for storing frequently used programs and personal data. The process actually helps in terms of security control and resource management. Having said that, many users who partition their hard disk drive always face a common problem whereby the size of the partition is either too huge or not sufficient. Users might have given careful consideration to the sizes of the partitions while creating them. But somehow or rather, things change or along the way users find out the size allocated for partition A which is supposed to store software is not sufficient while the size allocated for partition B which is supposed to keep music files is under utilized or too big. To format and recreate new partitions can be a challenging job. If too bad you fall into the situation, get EASEUS Partition Manager, a free Windows application to assist you. 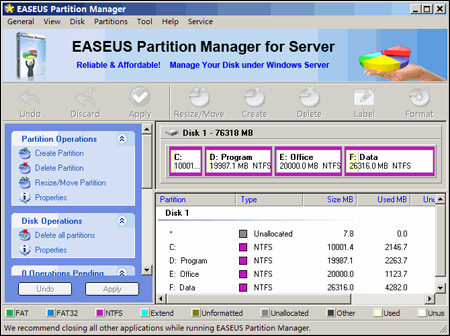 EASEUS Partition Manager is a helpful partition manager that allows you to manage your hard disk partition via its powerful functions: Resize and Move partitions, Create, Delete and Format partitions, Hide and Unhide partitions and change active/boot partitions. You can get the tasks done without damaging or destroying your data. EASEUS is giving away the home edition, Partition Manager Home Edition V1.6.4, for free. Users can just download it via the link here. Users need to pay if they opt for business and unlimited edition for business use. EASEUS Partition manager works well with hardware RAID. Users can label the partitions for better management and administration. However, this partition manager has some setback in terms of supporting a big capacity hard drive. This application only supports drives up to 800GB at this point of time. Version 2 of EASEUS Partion Manager has been released for free download.